Toronto Fashion Incubator (TFI) announces a new, free, fashion entrepreneurship program for aspiring accessory designers between the ages of 20 and 29. 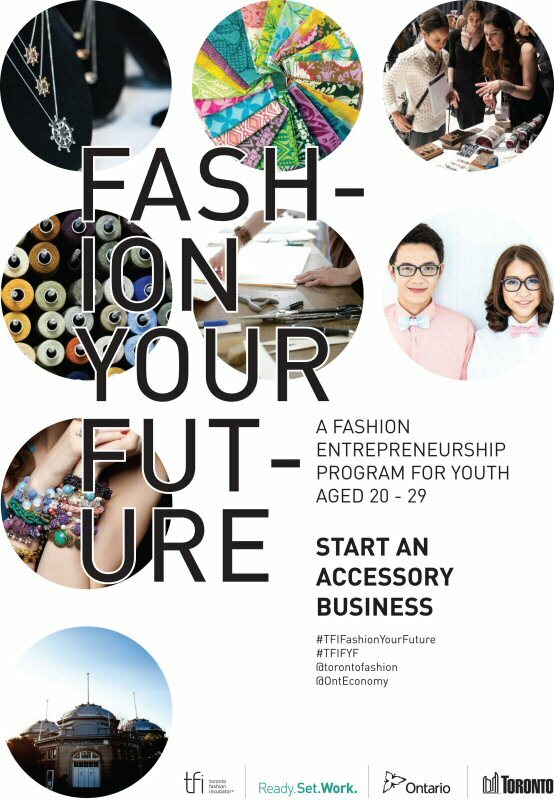 Launching July 20, 2015, TFI's FASHION YOUR FUTURE (#TFIFYF) rolls out in three phases to introduce youth to all aspects of starting and developing a successful fashion business. FASHION YOUR FUTURE is an initiative projected to engage 60 youth who want to start a fashion accessory business in the Canadian market. Youth are encouraged to register for a free information session to learn more about the program. -- July 6, 3:00pm, Toronto Fashion Incubator, 285 Manitoba Dr.
-- July 13, 3:00pm, Metro Hall, 55 John St. Funded by the Government of Ontario as part of the Youth Jobs Strategy, and supported by the City of Toronto, #TFIFYF will begin with an 18-day fashion boot camp. Attendees will learn how to develop an accessory line, source materials, visit designer studios and learn about strategic business elements including: pricing, business planning, trade show prep, and critical thinking. From the boot camp, 10 top youth will be chosen to participate in phase two and produce a spring 2016 accessory collection with help from a mentor and a TFI micro grant. In phase three, the top three collections will be featured in TFI's Press & Buyers Trade Show taking place October 21 and 22 at World MasterCard Fashion Week in Toronto. "FASHION YOUR FUTURE is a fantastic new addition to TFI's program portfolio," said Susan Langdon, Executive Director of Toronto Fashion Incubator. "It offers money, mentorship and market opportunities to youth interested in launching an accessory business. And it's all for free!" For program information & to register, contact Laycee Catalano, laycee@fashionincubator.com or 416-971-7117 ext. 30. The Toronto Fashion Incubator (TFI) is an award-winning and highly-acclaimed non-profit organization dedicated to supporting and nurturing Canadian fashion designers and entrepreneurs. Established in 1987 as the world's first official "fashion incubator", the TFI model has been adopted by cities such as New York, Chicago, London, Paris and Milan. Housed in an 8,000 sq. ft. heritage building at Exhibition Place in Toronto, TFI provides critical support to creative entrepreneurs to develop the business and professional skills they need to thrive and survive. Start-up and advanced community programs include educational seminars on the business of fashion, one-on-one mentoring with industry professionals, exclusive promotional and sales opportunities, and valuable sales, marketing and trend resources. To view the photo associated with this press release, please visit the following link: http://www.marketwire.com/library/20150622-TFIFYF-800.jpg.